hello readers, this is the 3rd post in my series of experiences while working with HXE2SP3. If you have read the other 2, thank you… if you have not, please check them out. In this section, I will explain how adding a nodejs module goes and some interesting learning I had while doing this. Thank you again for reading this far. Add a new module to the existing project. And Yes you are right.. the new reference is automatically added to the mta.yaml file. The package.json file contains the configuration for this nodejs module. Where is the entry point, and what other properties will be used in this module, such as scripts, versions, engines, etc. The server.js file – is the entry point of our nodejs module. Btw… while the nodejs module is starting.. we can go back to the cockpit and look in our development space. And then run the service to get the output from the xsjs service. You may be wondering.. where is nodejs, where is xsjs.. what is all of the other code.. 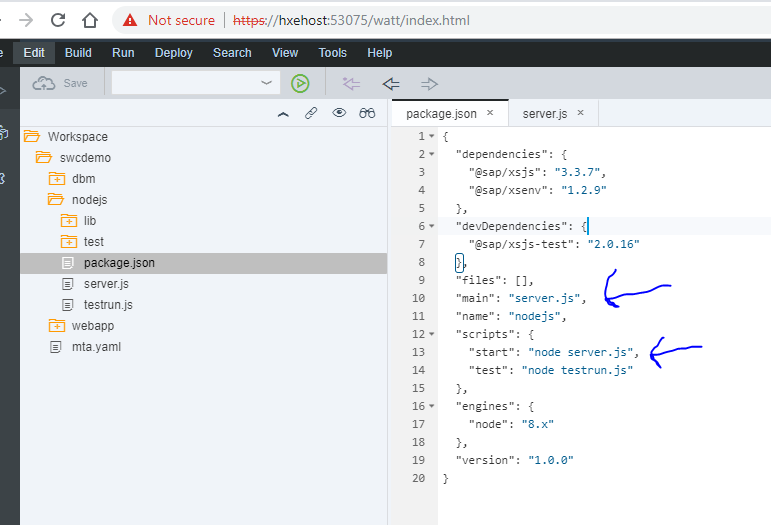 The best way to differentiate and know what code is being run, we can look into the file extensions..
js – this is the nodejs code.. you can also look into the different code function calls etc. now that we have the example working, let’s add the UAA-service to make it more robust, also add the dbm module as a dependency to be able to call the db and extract data. 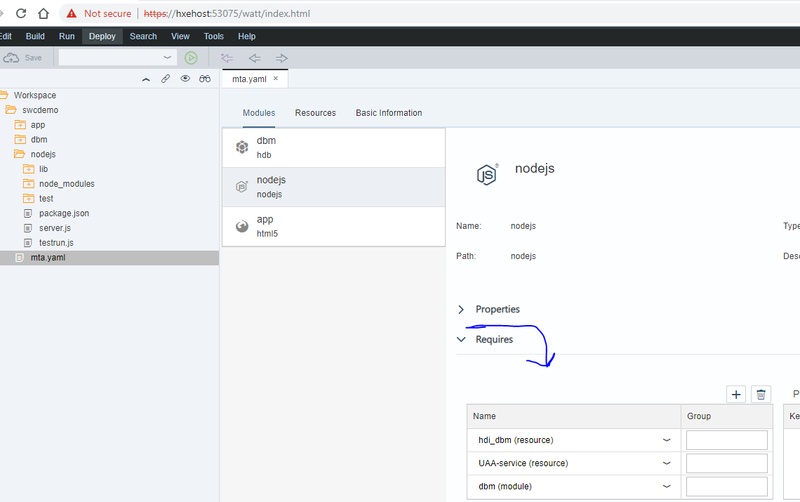 Now, in the app module… let’s add a reference to the nodejs module so that we can make calls from our UI app to the server side and even navigate from the browser (nodejs module). In the mta.yaml file, under the Requires section add the nodejs_api provider. * notice the provider and the resource types. 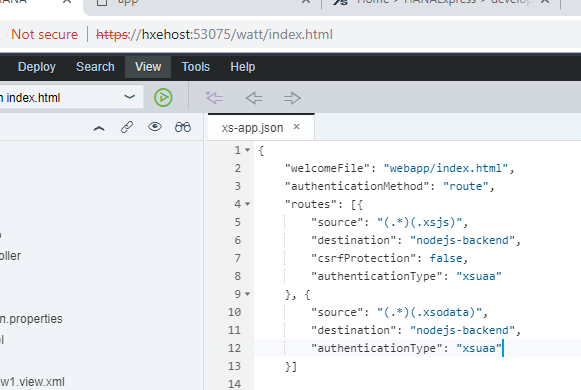 Then add the routes to the xs-app.json file. Re-build and re-run your web app module since that will now be our entry point. If you do what I did…. I went back to my hdbcds file… added the odata annotation, re-build the db module… re-run and looks like v2 still 😊 so let’s go build a Java module, why not. 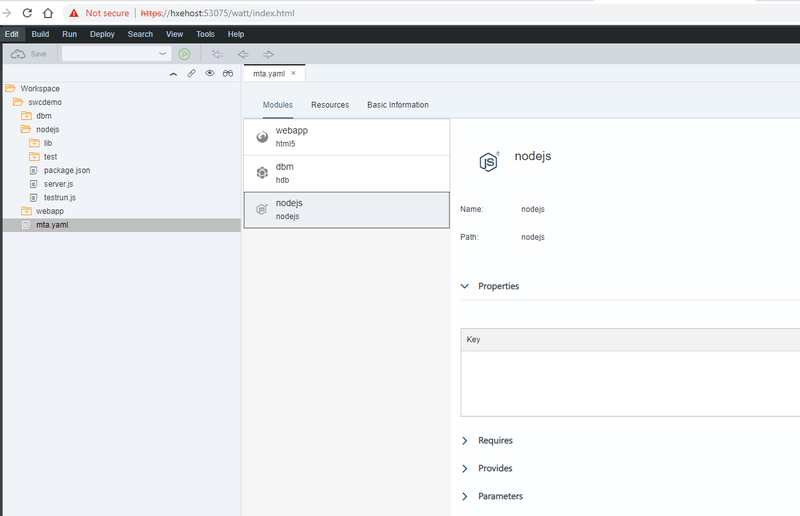 by this point, I have created a new project, a ui5 module, a db module and a nodejs (xsjs compatibility mode) module. 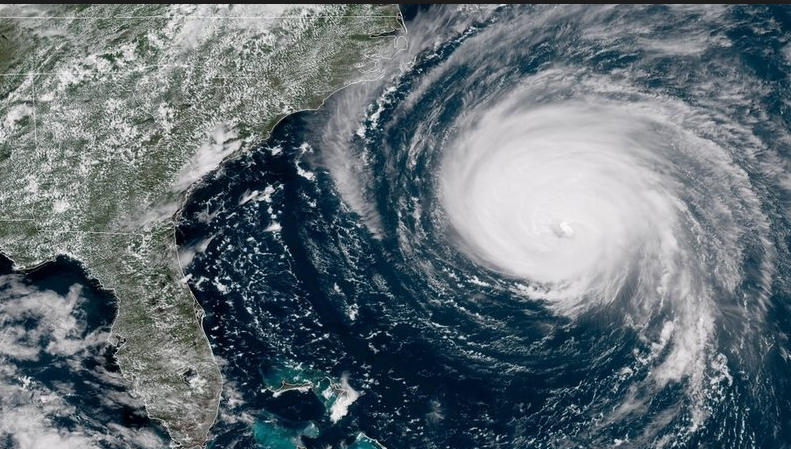 All the moving pieces feel like what’s happening on the east coast – jk – hope every one is doing ok in those areas. Thank you again for reading this blog, please share your findings, experiences, and issues. 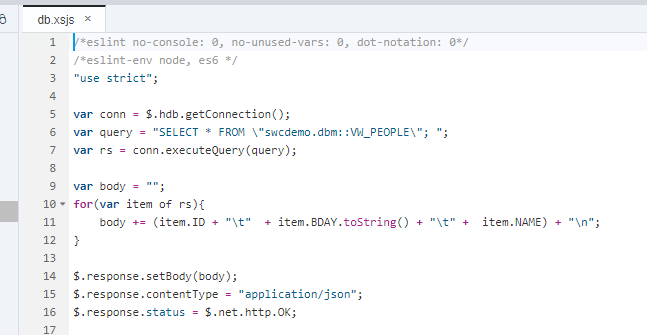 These are interesting blogs and great to see your take on how your development experience went with SAP HANA, express edition SPS03. Aside from the ones you mentioned in this blog series when creating each of these modules, were there any other significant things you experienced during development that you think could have been a better user experience? Also, have you tried this on another environment besides a VM on your laptop, something like a cloud instance or container? thank you for the comment. I have not tried the cloud or container instances but I will probably do that next to see and compare myself other alternatives. As far as sgnificant changes are the tools primarily such as the mta graphical editor, the CDS graphical view… and the web Ide – this is in comparison with my experience on HANA 1 SP12. As far as UX improvements … I am not sure if this would count as an improvement but having the cockpit and cockpit manager seems somewhat confusing on the naming of 2 tools… I think this would have been ok to keep on the same tool with a different set of permissions or roles, just from my personal opinion. I’ll think of others and let you know once I do a few more examples. Thanks for your feedback here about your own user experience with the new version, and your take on the Cockpit tools. Greate blog Sergio, save us many hour of testing and struggle with bad documentation. 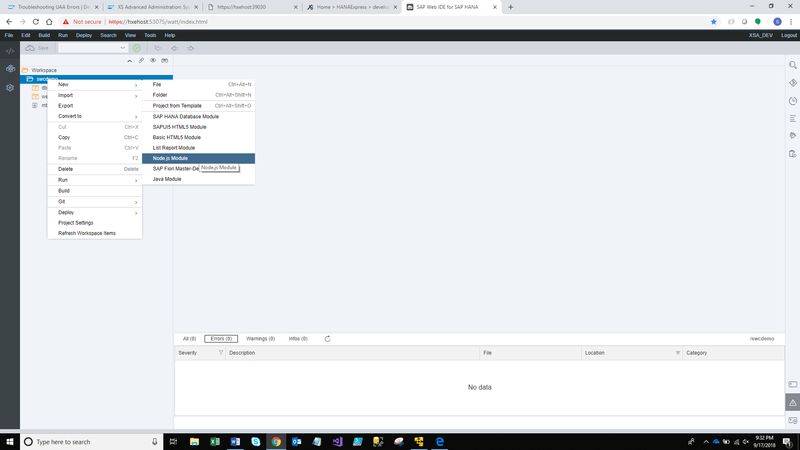 Just wondering if you can explain how we can use a Odata connection in a SAPUI5 module. Any guidens will be appreciated. was this what you were looking for? let me know if you have additional questions. good luck! Thanks for fast answer. 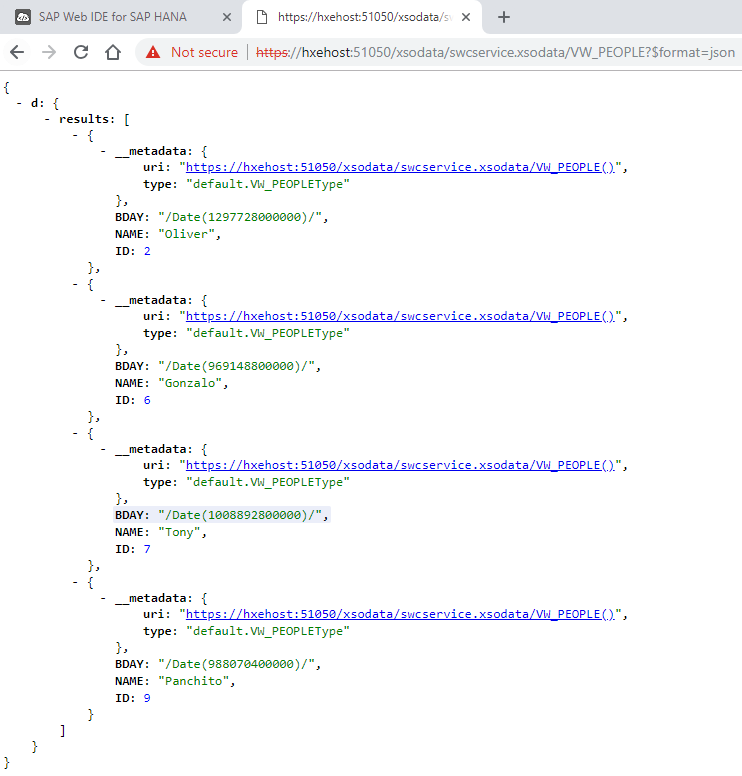 I was hoping the I could use my Odata connection that I have created with the eclipse HANA modeler tool. And link that to a Entity set in the layout editor. 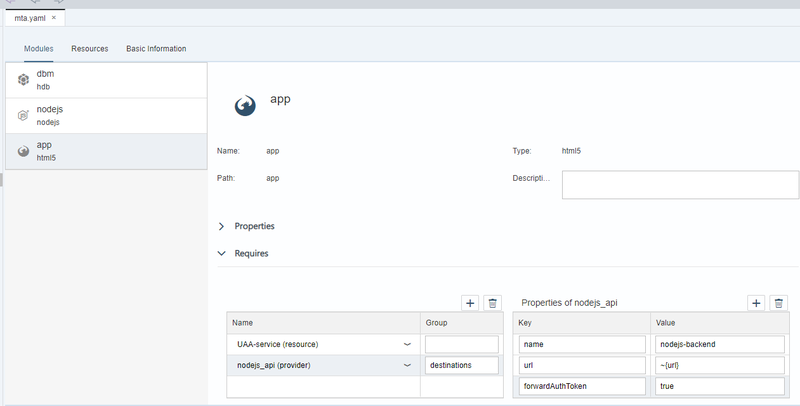 Do you know how to use the enity set in the layout editor, is it possible to consume the odata connection I have created in HANA modeler. I have not used it there, but… it looks like no Entities are defined yet. I have tried to find a palse to add the Odata service URL, but have not manage to find the place. The Odata is up and runing and I can see the output in the browser. I have also made it possible to use the service as an anonyous user. I have added a couple of controls, but not been able to spot a plase to add the URL.